The 31st October 2010 marks the 200th anniversary of the opening of the Glasgow, Paisley and Ardrossan Canal. The initial stretch opened was between Paisley and Johnstone; with the length between Paisley and Port Eglinton in Glasgow was completed and opened the opening the following year. Why was the canal needed and who was behind it? The answer to both comes down to one man the Earl of Eglinton. Hugh Montgomerie, the 12th Earl of Eglinton had recently completed new docks in Ardrossan, and he wished to create a simple way to transport goods from Glasgow to his new Port. The roads of 1800’s Renfrewshire or indeed Lanarkshire and Ayrshire were not suitable for transporting items such as coal over long distances, and then other transport system which we know today – the River Clyde – was not navigable to large ships as it was too shallow. Shareholders in the Canal Company included many Merchants and landed gentry of the county and beyond. The Instigator of the project, The Earl of Eglinton held 60 shares, followed by the likes of George Houston of Johnstone and Robert Fulton of Hartfield who held 10 shares or William Dixon of the Govan Coal Company and Iron Foundry who held just 2 shares. Reading the list of shareholders is like reading a who’s who in Renfrewshire’s past. Shareholders included ministers such as the Rev Urquhart of Kilbirnie, Robert Speir a writer in Beith, Robert Caldwell another writer from Lochwinnoch and John Peddie Rector of Paisley Grammar School. The canal never got any closer to Ardrossan than Thornhill in Johnstone, and if you look closely enough behind the Canal Garage, on Canal Road, you can still make out partial remains. The other terminus was Port Eglinton in Glasgow, with a third basin in Paisley, where a T shaped basin was fed by the St Mirin Burn. The Canal Basins in Port Eglinton and Paisley are both lost; Port Eglinton, covered by a builders merchant and the Paisley basin now covered by the Castle Gait housing on Canal Street. The Canal saw two disasters in its short life time. In May 1810, before the Canal opened, Paisley poet, Robert Tannahill died by his own hand, drowned in a converted stream (the Candren Burn) which fed the Paisley Canal. Tannahill’s body was found in the Canal close to the Bridge which carried the main road to Meikleriggs and Foxbar. To this day the spot is known as Tannahill’s hole. 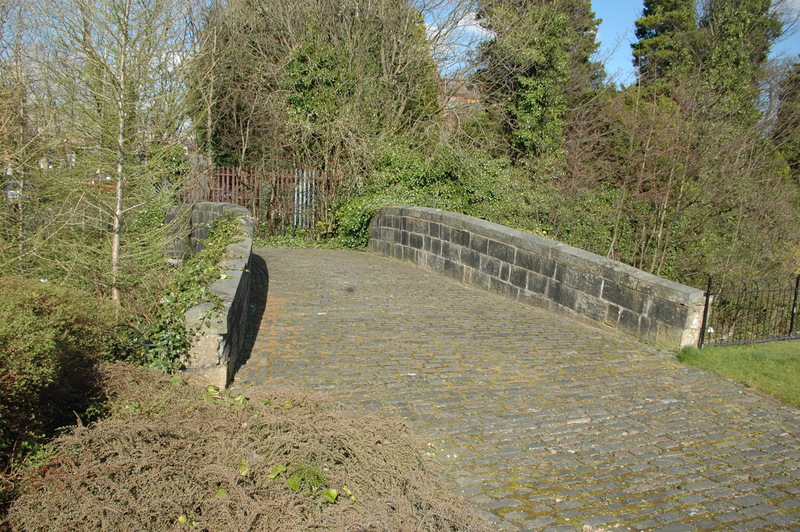 The old bridge which carried the Paisley to Foxbar road over the Canal. Tannahills hole is just to the right of the bridge. The bigger disaster happened on Saturday 10th November 1810 – the Martinmas Fair – The canal boat the “Duchess of Eglinton” was returning to the Paisley Basin from Johnstone. The outward trip had been popular and the just as many passengers were waiting in Paisley to make the journey again. As soon as the boat drew up beside the dock, there was a surge of people getting off; the passengers waiting to get on were also impatient and surged forward. In the chaos that ensued, the boat capsized. 115 people and children survived, though almost 200 of all ages died. 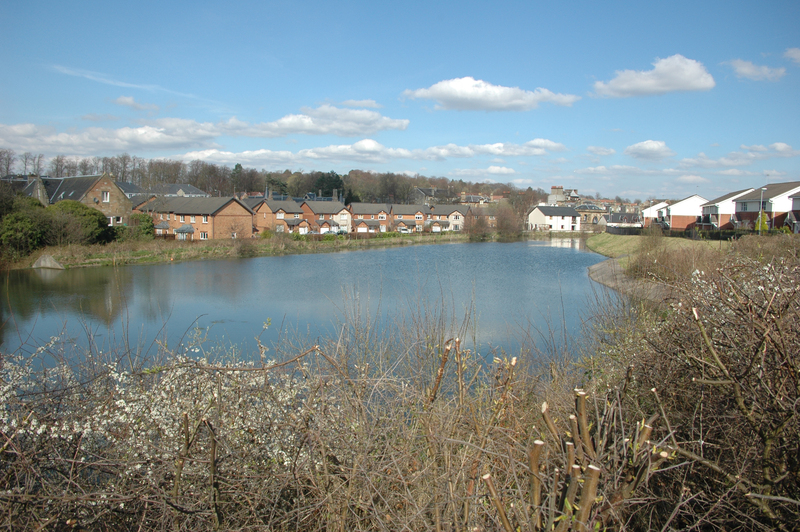 The Remaining Canal Basin, built for the J &P Coats thread works in Ferguslie.